A cardigan is a spring uniform of sorts, allowing the wearer to layer beneath in preparation for that unpredictable wind gust or blast of raindrops. 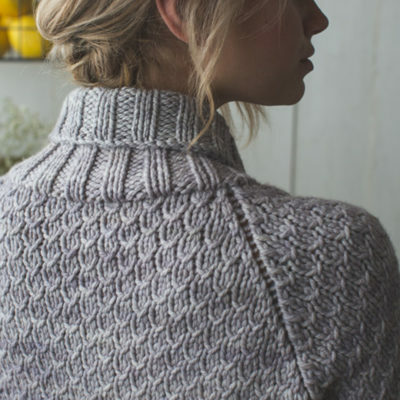 With the Interweave Knits Spring 2019 cover project, the Verbena Cardigan, you will be snug during those chilly spring moments when you cannot resist chasing down the fresh air. This garment should be on a hook by the back door, awaiting very specific spring activities: eating al fresco in the dwindling light, star gazing, or taking a slow walk through a field of earnest spring flowers. 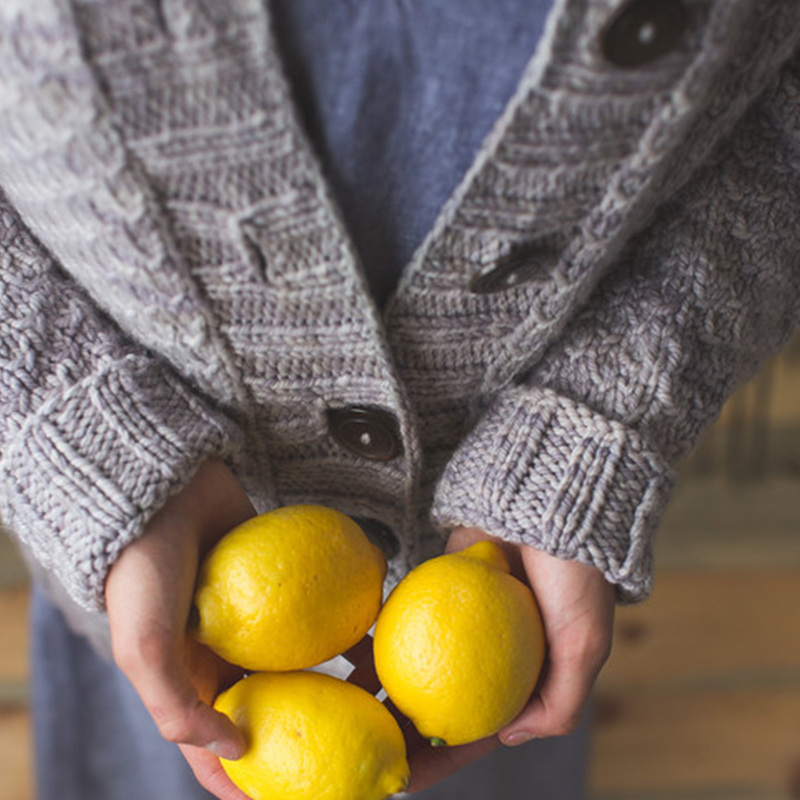 You may feel yourself being driven to gather citrus while wearing the Verbena Cardigan. All photos by Harper Point Photography. Designer Tori Gurbisz makes her mark by laying down thoughtful motifs in her work, with a few practical gestures here and there. In the Verbena, this is seen in the ribbed cuffs and the handy pockets. It is knit seamlessly in a bulky-weight yarn (Malabrigo Yarn Chunky) from the bottom up. The textured fabric requires a simple stitch pattern, and the shawl collar, turned-back cuffs, and deep pockets give the sweater an extra-comfortable feel. Explore more of Tori’s work on her Ravelry page. My guess is the you will find yet another “just right” item from Tori’s selection of approachable projects. All photos by Harper Point Photography. Finished Size 34¼ (38¾, 42¼, 46¾, 50¼, 54¾, 58¼)” circumference at underarm, buttoned. Cardigan shown measures 38. “; modeled with 3. ” of positive ease. Yarn Malabrigo Yarn Chunky (100% merino wool; 104 yd [95 m]/3. oz [100 g]): #CH036 pearl, 11 (12, 13, 15, 16, 17, 18) skeins. Needles Size 10 (6 mm): 40″ circular (cir) and set of double-pointed (dpn). Size 10. (6.5 mm): 32″ cir and set of dpn. Adjust needle size if necessary to obtain the correct gauge. Notions Markers (m); removable m; stitch holders; tapestry needle; six 1⅜” buttons. Gauge 14 sts and 18 rows = 4″ in Textured st on larger needle. Get the Latest or Subscribe to Never Miss an Issue!